Our bestseller—now better than ever! Enhancements to our regal replica of an antique corkscrew promise years of effort-free openings. A smooth-gliding, Non Stick coated worm removes corks (natural and synthetic) with a simple pull of the handle. Inner workings and grapevine-relief casing made of lasting zinc alloy. Antique bronze finish. Can also mount to your bar. Includes 19-1/2"H Birch stand with stationary corkscrew available in Antique Bronze or Antique Pewter. We just got this wine opener and everytime we go to open a bottle, instead of pulling the cork out it forces the cork into the bottle and makes a big mess. What are we doing wrong?? can you recork a bottle with this item? BEST ANSWER: It's strange that the staff reviewer doesn't know that recorking is one of the best things about this product. (The video right here on this site shows how to do it.) Anyway, the answer is yes. I have had this product for over 20 years and have recorked thousands of bottles of wine with it. What's more, the cork usually, but not always, ends up flush with the bottle top again. It's very good at it. I don't know if they still include this, but mine came with a small plastic cork holder so that, even if you had already removed the cork from the device, you could reload it for recorking the bottle. If they don't include this any more, they should. Thanks for your question; unfortunately you can not re-cork a bottle with this wine opener. What is the rubber block for that comes with the stand? BEST ANSWER: It is to protect the surface you are mounting to and prevent twisting. FOr example, if you mount this to your granite countertop, you put the rubber blocks between the counter and the clamping mechanism to protect the counter. The rubber block is used as a cushion if you prefer to use the wine opener on a counter top or attached to the edge of a table. Used as a buffer to avoid scratching. BEST ANSWER: Unfortunately you cannot personalize this item. BEST ANSWER: We do sell slugs and augers and other parts for the Legacy opener. They are not compatible with Rogar. Is there a warranty on the Legacy Corkscrew? I bought one 7 months ago, probably used less than 10 times, and it is broken inside. BEST ANSWER: Yes the legacy has a 1 year warranty, please call us at 1-800-648-6058 for further assistance . I need 3 replacement worms for the opener, do you sell them..? BEST ANSWER: Yes we sell the replacement worm. BEST ANSWER: Thank you for your question. You have 30 days from time of receiving the item to return the legacy corkscrew. Any other questions please call us at 1-800-356-8466. How do I replace a bent corkscrew worm? BEST ANSWER: Please call us at 1-800-356-8466 and a replacement worm can be purchased. Where can i get parts for the corkscrew? 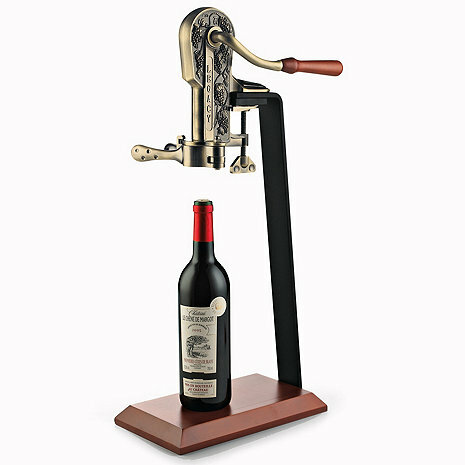 Hi, I bought one of these Legacy Corkscrews with stand for my husband several years ago. It no longer pulls the corks out. Is there a way to have it sharpened so it will work again? Cheaply constructed. Failed after less then 60 days. The inner workings are largly constructed of cheap plastic. Cannot recommend this. I was replacing an old wine opener that I got from you several years ago. This one is not near the quality of the old one and it is almost impossible to pull a cork. It takes too much strength. This thing is horrible. The stand bends as your trying to pull the handle, which makes it very difficult. Also the cork screw doesn't seem very sharp and takes a lot of effort to get it into the cork. On top of that it flimsy. The bushing on the handle side wore out very quickly. If my wife hadn't gotten it for my bday I would have sent it back. Not worth the money. Love the look and ease. However I am replacing the corkscrew part because the worm stopped working. Because of the height it does not fit under the kitchen counter so must find counter space without cabinets above. Very well made and beautiful. This bottle opener is awesome. I gave it five stars because it so good however it does not come with instructions and I would highly recommend going to YouTube to watch a three minute video on the correct way to work it. Bottle openers are not complicated but this is an opener and a re-corker and it works fantastic once you understand. Wine Enthusiast is such a wonderful company! My order was placed late Thursday night, December 17, and my brother-in-law received his Legacy Estates Birch Wood Stand Wine Opener Christmas Eve! Perfect timing! This wine opener not only adorns your kitchen, bar or wherever you place it, it works with two movements -- one pull of the handle forward to open and one push of the handle back to recork! An awesome work of art! I got this opener for my birthday and I absolutely love it. We enjoy wine a few times a week and this is the perfect and easiest wine opener I have had. I love the way it will re-cork the bottle if needed. Superb product that works like a charm! Awesome product that looks good and works fantastic! The Legacy is a conversation starter, we use it whenever we open a bottle of wine. I love the fact if we don't use the whole bottle we can re-cork it! (Not that that happens very often) This order was actually a gift for a dear friend. This thing looks great on our bar and opens bottles in an instant! We received this as a gift years ago and have loved using it. We now give it as a gift ourselves. I use my Legacy Corkscrew at home alone or with friends. It is both functional and beautiful!!! It was an amazing birthday gift from an AMAZING friend. She knows me so well!!! We love the wine bottle opener! Very disappointed that there were no assembly instructions included. Though we figured it out by looking at a picture, there were different sponge pads included but which were we to use? The only way we knew how to operate it correctly was to watch a YouTube video. That's just a little ridiculous when you consider how much was paid for this opener. Purchased this for dad and weeks later he pulled me aside to say how great it is! Counter-piece attraction. Well built. Easy and smooth to use. Great Product at a Reasonable Price!! Reasonably fast delivery. Good packaging. Easy to assemble and distinguished looking. I didn’t pull it all the way done the first time So cork only part way out. Once I pulled all the stroke length, like an old fashioned slot machine, it worked perfect. We received this product as a gift years and years ago and still use it every day! It is the best gift we ever received and I'm buying one again for a wedding gift! Gave it to my wife for Christmas. She loves it.It is easy to use and looks good also. Very solid. We purchased this item for someone who has Parkinson's disease and is sometimes shakey. He was able to open the wine on the first attempt. Great to open wines. Never need to search for a wine opener. I had one like this years ago and decided I wanted to have one just like it again. I bought this one for a gift. I have had this opener for a few years and love it. Best wine opener on the market! I've had this corkscrew for 10+ years. Just had to replace the insides, took an hour, works perfectly. Bought two more as Christmas gifts. Much better than what I was using before.. The cork screw that is always ready. It removes the cork on the forward stroke and replaces the cork on the return stroke. Very practical, nice looking. Need an information brochure. How about a companion foil-top remover. Very nice looking wine opener, but we haven't been able to get it to work correctly yet. Would have been nice if it had come with directions for proper wine bottle opening using the device! Very Nice but you have to hold bottle in air with the clamps but works great. Not for Left Handed People, only has handle for right handed people. Easy to use, fast. Lady friend tells me it is a little on the hard side for her to use. Nice device for classic wine cellar. Attractive. Have mounted it to a table. Don't care for the flexible metal upright, too much bend when using. I brace it with my arm. Otherwise, easy to use...just follow the directions. I've had one of these for years. I have rebuilt it one (Plastic parts inside). I replaced it last year because it wore out. I bought this one for a Christmas present this year for my mom. Bought in the middle of December and did NOT receive it until the middle of January. My mom got it on January 17th. almost a month after Christmas. The wooden base was badly machined and would not accept the stand without being enlarged. The box says you can reinsert corks but gave no indication how. One of the rubber grippers fell out on the second use. Looks cheap and not very durable. Top is good...bottom not so much. I like the way the opener works. The stand does not give good leverage for opening a bottle. Stand lifts off the table when I try to use it and I have to press my forearm against the front of the opener to prevent it lifting up. This is uncomfortable and difficult to do. I am giving this away to someone as it is harder to use than the "rabbit" type handheld opener I have. I wanted easier, not more difficult. Perhaps it would work fine clamped to granite counter but I don't have a place to do that and must use the stand. Strong out of gate, not much on stamina. We have gone through 2 of these. WE replaced the first one and have worked great at first but after a couple months they break and the corkscrew stops working. Looks good on my countertop but what good is it if it can't open our botles? When asked why it broke in the first place, no one had an answer. Hard to use for anyone that is not strong, also it is too tall. The boxes the pieces came in looked like they had been thrown around ,rips on the packages .It was embarrassing to watch our Daughter open the box the other boxes (with stand and opener came in ) and see the 2 beaten up boxes inside. Got one wine opener from Frontgate , Was packaged beautifully in a classy box . When its put together hope it works? Quality control needs to follow up on this . I agree with most of the other reviewers. It is a stylish piece that your friends will notice, but use a waiter's corkscrew to open your wine, not this thing! Hard to remove the cork from the worm, and takes a lot of muscle power for a clean act of uncorking. Better used on the bar to start a conversation. Product was returned---would not remove cork from bottle !!!!!!!!!!!!!!!! !